Venus looked like a solar disc immersed in the stain. Sketch shows its position relative to the Sun at 5:22. 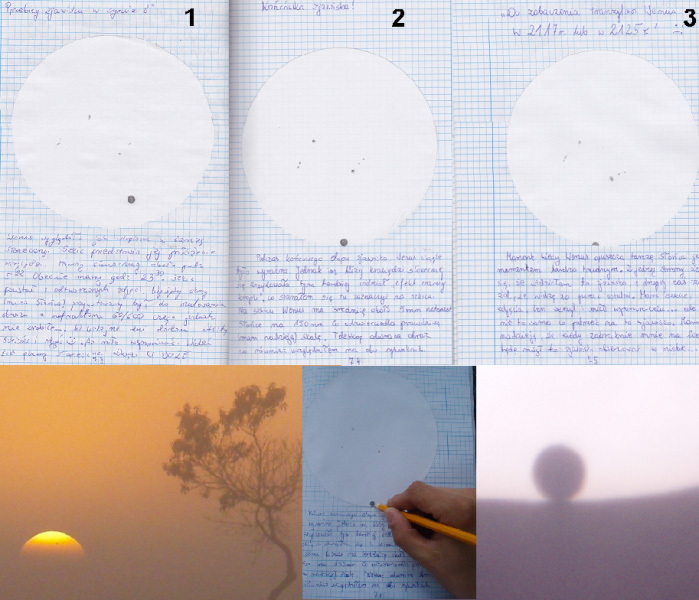 I threw the image of the Sun and Venus with a telescope 60/600 on the white paper, and marked its location. Then at 23:30 pasted this sketch in my journal of astronomical observations.You can also see a group of sunspots. During the final stage of the phenomenon of Venus was still evident. But the nearer edge of the Sun was located, the bardziiej could see “black drop effect,” which have said the sketch. The moment when the transit of Venus ends the last of this century is very difficult. I held my breath. I’m glad I saw it but when Venus left the disc of the Sun at 6:54 I felt a great sorrow. With barely said goodbye Venus.This was my first and the phenomenon of this type, k, I thank God for good weather. I hope that the next transit of Venus seen from the sky. Telescope: Newton 200/1200 power 48x.